Mine was not love at first sight. And I don’t remember when exactly that titration point arrived, when a drop fell with a plop and transformed my care for a cousin overnight to a longing to have a soul mate out of that relation. I decided to propose to her. Still I am sure: my love was not sudden, it could have happened by degrees in my life. I never believed in love at first sight. 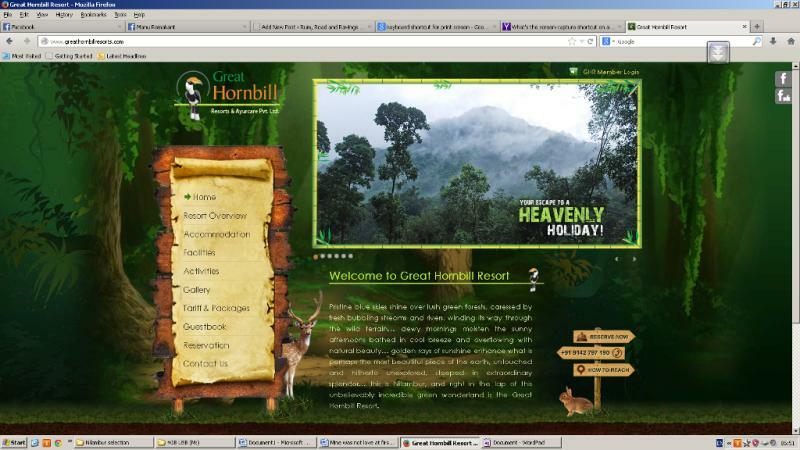 Until, I came across the website of the Great Hornbill resort, Nilambur two weeks ago. Wah! You should see it. The greenery bowled me over instantly. Half an hour later, my scholarly search for ‘decent’ information ricocheted involuntarily into sleazy websites, as it happens every other time with Google. Suddenly my ears picked up a river instead of caterwauls. It was loud. To imagine the voice of a babbling river rising from the vocal chords of those women was extreme. No amount of heat could make them produce such liquid cacophony. What is it? After a moment of confusion I reached the source of the river – The Great Hornbill page was only minimized, not closed. “Pristine blue skies shine over green forests, caressed by fresh bubbling streams and rivers…” The webpage welcomed me back. Now the resort hit me a second time. Love at second sight. I skimmed through the facilities they offer: Mufti-cuisine restaurant. Travel desk. Games Room. Kids Park. Natural Pool. Swimming accessories. Now to activities: Trekking. Spice tour. Rubber Tapping. Bath in Crystal Clear water. Enjoy Farming(?). Camp fire. Cycling. Archery. This would be a hell of a trip man! Friends, I am not interested in telling this story in detail. Great Hornbill: The greener side. 1) Delicious food and a wonderful room. The thani naadan puttu- kadala breakfast was something I could never resist. 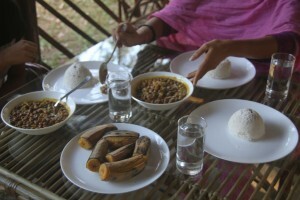 And the traditional meals for lunch and Chappathy-chicken curry for dinner were also perfect for me. The room was simply great. 2) Good service. Most of the service personnel were untrained villagers and there was something raw in them which we liked a lot. Every time Soman, our caretaker would bring us something, he would be very apologetic telling us: “Kindly excuse us if there are any flaws, sir. We are only learning, sir.” Good sir, but please don’t tell this to everyone who comes here, sir. Few are interested these days in spending 6500/- for seeing people learn on them. 3) Rubber estate. There are rubber trees everywhere. Great Hornbill. The greyer side. Puttu, kadala, meals, chappathy and chicken curry are the multi in multi-cuisine. If you insist you get omlette and lemon juice as well. Travel desk (as promised in the website). Probably you are now reading about the temple and the bridge as their new ‘facilities’ in their updated website. I saw a cycle. But with the extreme gradient on the road that passes along the estate no sane person will use it. The cycle rusts in peace. This could be some post-Hornbill effect on the poor woman. Must take her to a doctor if it continues, I made a mental note. “Sir, we have an air gun. If you want you can practice some shooting,” they told me. “I want it. I am interested,” I said, as I was almost bored to death after three hours. A boy brought a long and sturdy rifle. Soon my family, comprising my ardent fan (read wife) and my not-so-ardent-since-she-got-to-her-teenage daughter, followed me in a single line as we marched to an open ground inside a thicket. I loaded the rifle with a pellet. “See, how your father blasts off that bottle,” I told Ammu. “What happened?” “Sir, I think the pellet got stuck,” the boy replied. “Can you help? “ “I am sorry sir, I see this rifle for the first time. Never used it.” We sat on the ground. With the boy looking at the process curiously I began to scrape off the pellet with my finger nail. It took ten minutes. Once again I took aim and pulled the trigger. Cluck. Stuck again. The fifth time we sat on the ground with me scraping out the pellet and the boy looking on curiously, my family – the ardent fan and the not-so-ardent-since-her-teenage – looked at each other, rose together and slowly shuffled off from the scene to watch the more exciting art of rubber tapping still going on in the estate. When the sun finally set behind the trees, I decided to call it a day; the shooter in me was survived by three bottles still sitting in a line on a distant rock. That was archery at the Great Hornbill. When we finally got to the source of the voice – that I first heard in the website while I was at my home watching different sorts of visual – we found that it was more gurgle than river. To take bath, I had to carefully push a few boulders out of my way, make a bed in between and spread myself out into the shape of a Chinese alphabet to fit in. The river was shallow. In order to get every part of one’s body wet at the same time one had to lie face down and press one’s whole body hard on the river bed. At some point during the immersion and tweaking of the body I thought for a moment that I had turned into a morsel of porotta someone was twirling in some gravy to get it smeared on every part. Finally I got out and shook the river back on the pit; I looked disappointed. They plant the rubber. They milk the rubber. They sell the rubber. They make a living out of the rubber. How do we enjoy such farming? “Manu chetta, I have a plan.” Light hits and here my wife sits bolt upright again. Did we really put them into our website? We didn’t know. They shared our surprise. Evening, we were led to the end of the long road that runs along the resort. After a stroll of 500mts, we reached the forest border. They stopped. What happened? I asked. Maoists! Who? Maoists. It is dangerous to go beyond this point. They could open fire. Sir, There is a big rock inside. Amazing. Awesome. You should see it. You can get to its top by climbing through a creeper. Let us climb then. No. Maoists. We could have climbed but the Maoists could be lurking there with their rifles. They could open fire. And the forest officials will never allow us to enter. Maoists, Maoists, Maoists! The Maoists are against trekking. The Maoists are against spice tour. The Maoists are against swimming. 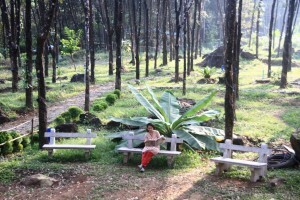 The Maoists allow only rubber tapping and fleecing the poor tourists in the name of resorts in this part of the world. We came back to Trivandrum with heavy hearts. No more resorts for a long time, I decided. My wife was seemingly disappointed; she didn’t know how to fuse this Maoist number with her rubber estate in Kilimanoor. There was no forest bordering her property, but only a town. Ammu was the only one happy. No more family trips for quite a long time now. (Must say it all. They gave us an extra breakfast and gifted us with a bottle of honey. 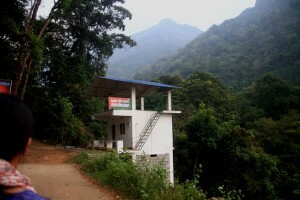 All for 6500/- a day for a stay in a remote location in Nilambur. Please visit their website and resist temptation. Don’t be fooled by the photographs I post here. You stay in a rubber estate for all that money. Good luck). But you remember the spooky stay we had in Nilambur, Manu? Remember those jumbo-sized lizards? But the drive back was good. Sabin, I will write about that journey soon. Totally loved the piece.I was considering booking some resorts for the vacation by seeing their website,but now will think a second time. Yeah Kavs, you get totally different stuff when you get down from the website to the actual place in most cases. This is funny! You should post this link on their Guest Book. I sent it to their guest book as you suggested. People are good; they showed the magnanimity to call me and offer a discount for all my troubles. That’s a good piece of information. As one of the men who offers a wonderful stay in Nilambur for many years, you know better. Mark his words, dear readers. Thank you Binuraj. Yeah we fall prey for such things they brandish on their websites. One must be very cautious about these things when one travels around. 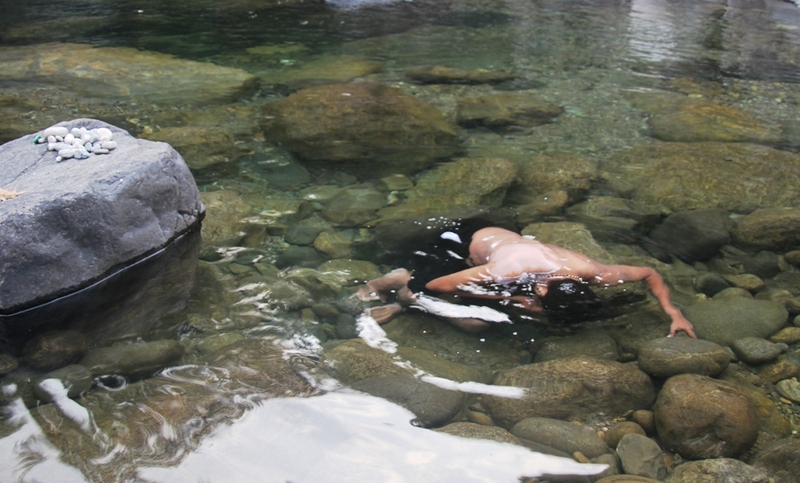 If you are going back for discount, let me accompany you… i would like to enjoy natural pool. Do not think all people in nilambur are like this.